Joseph Caldwell, 1773-1835 Address to the Senior Class and Before the Audience Assembled at the Annual Commencement on the 28th of June, 1827. 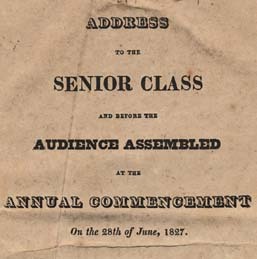 Address to the Senior Class and Before the Audience Assembled at the Annual Commencement on the 28th of June, 1827. Raleigh: J. Gales & Sons, 1827. Science and the humanities -- North Carolina.